If I had to pick a favorite Asian cuisine, it would be Vietnamese. I think it’s a combination of the climate of the country and the French influence that seems to have really set Vietnamese food apart from other Asian countries. 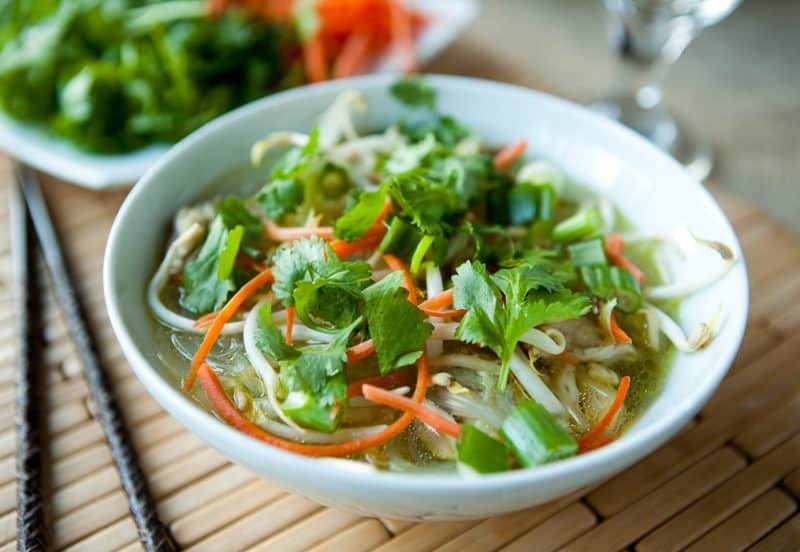 Almost all Vietnamese food is light, healthy and so fresh, like this noddle soup. Vietnamese noodle soup was my first encounter with Vietnamese cuisine. I use to go to lunch at least once a week with a good friend, and we would enjoy this beautiful soup at a local restaurant. It was so fresh and full of veggies, and so good. Loving it so much, I quickly learned to make my own version at home. It’s a quick and easy soup, and makes a hearty meal that’s not full of fat and calories. Add chicken stock and chicken things to a large soup pot. Bring to a boil, and reduce to medium heat. Add Chinese five spice and ginger. Cook for 20 - 25 minutes, or until chicken is done and no longer pink. Add hot water to a large bowl with noodles. Set aside for 5 - 7 minutes, or until soft. When chicken is cooked, remove and shred with two forks. Add back to broth. Then combine shredded chicken, broth, noodles and hot water in soup pot or a large bowl. Mix to combine. Serve soup garnished with fresh cilantro, bean sprouts, green onions, fresh cilantro, a lime wedge and sliced jalapeno if desired. This post sponsored by Tablespoon.com. 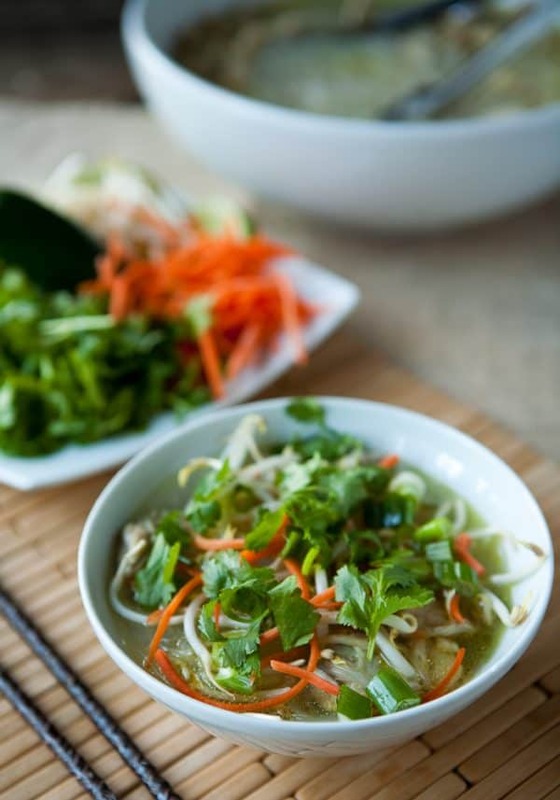 I always love this broth – so comforting – wish I had this for lunch today! This looks so good, Angie! I love Vietnamese cooking as well, also Thai. This soup is so pretty & I bet delish! I make a similar soup, but I use a whole star anise to flavor the broth. I love Chinese 5 Spice – not sure why I didn’t think of adding it before! Pinned this and finally tried making this last night – it was fabulous!! As a shortcut, I used a roasted chicken from the grocery store. A great contrast between warm/comforting and fresh/crunchy! Next time I will also try adding Thai basil for another dimension. I can’t find the link to the actual recipe. I know it was once here cause I made a grocery list off of it. But now I can’t find it. Can someone please help fast. I am sitting here with a whole cooked chicken all these fresh ingridients and have know clue what to do with them. 🙁 The recipe was here yesterday. There it is, somehow the code broke, so sorry!